Restaurants, like hotels, have ghosts. People meet, fall in love, fall out of love, gather, pray, eat, reunite, talk business and sometimes even pass away at these establishments built solely to offer rest and sustenance to the paying public. And while a hotel play (of which there are plenty), takes advantage of the various ways people can meet and separate in that building only to return wiser, sadder or funnier, a restaurant offers little more than one open space. Playwright Dan LeFranc circumvents this limitation by presenting a multigenerational span in the same space without resorting to a cast of dozens or serving up yet another trite treatise on the bittersweet love and life challenges of an American family. On the contrary, The Big Meal is inventive, tightly woven and despite its reliance on certain clichés, is poignantly hilarious. Michael McGarty’s beautifully restrained scenic design deserves much of the credit here as guest Director Tyler Dobrowsky is able to have tables come together and move apart organically, mirroring the dynamic shifts of the central family without looking like a scripted scene change. This is a crucial point in accepting the central conceit of the script — starting with just two actors, a young couple fetchingly portrayed by Joe Short and Amanda Ruggiero, time passes literally in the blink of an eye. The two set the pace for what becomes a dizzying array of rapid-fire leaps into the future with sometimes as little as a turn of the head to indicate a new scene. As Sam and Nichole court and spark, children are introduced, older characters brought in and then we’re left sometimes with only a carefully coordinated color palette by Costume Designer David T. Howard to let us in on who everyone is, was and will become. The device could falter miserably in the hands of a less talented crew, but Dobrowsky has cherry picked eight stellar cast members, including the young, but versatile Emiline Easton and Elliot Peters. Richard Donnelly and Wendy Overly graciously share the spotlight, but The Big Meal quickly becomes their show. While Steve Kidd and Karen Carpenter work the hardest here to keep the convention alive, it is the oldest two cast members who, in a perfect metaphor for their grandparental stature, sit back and enjoy themselves while the younger generations scurry about and move the story to its bittersweet conclusions. Perhaps because these two inherit the weight and complexity of all of the generations that precede them, they don’t have to work as hard as, say, Carpenter, who, like Short, exhibits an almost athletic precision in the transitions from one period and one persona to another. Indeed, Donnelly and Overly’s weightiest moments come in perfect silence, as the inevitabilities of time descend on the family. The loss of family members piles up, both expectedly and unexpectedly, yet LeFranc’s taut script invests us in all of them just enough that we are allowed to feel their loss, even when we know it is coming. The Angel of Death comes not in the form of a hooded apparition, or saccharine sound effect, but as a waiter, impersonally and efficiently delivering the only actual food we ever see onstage over the course of countless meals over the course of the play’s 90 minutes. These last meals are eaten silently, deliberately, solely lit while the surviving family members portray their grief in the dim solemnity of the background. It is these moments where the overlapped, almost operatic conversations cease and what could be interminable silence becomes a weighty reflection on their lives, and our own. This family is no different than our own, no events occur that we cannot relate to and we feel the losses as keenly as they do. “We should take the time,” is the rallying cry here and everyone leaving The Big Meal is induced to turn their cell phones back on and call their loved ones. The Big Meal is not an Important Play, nor even the best offering The Gamm has given us this season, but it does have a profound impact, mostly because of the tidy way it invokes love and loss without becoming maudlin. A lesser cast would certainly have ruined it and a director less astute than Dobrowsky could have overplayed his hand. This production is more than simply “Cat’s in the Cradle” reimagined as a One Act, it is a portrait of our lives that embraces the circularity of life and death. We are born, we fall in love, we marry, we procreate and we pay for our happiness with the loss of all we aim to achieve. However, if we are true to each other, than we can always be together. Unlike a hotel play, the faceless chain restaurant(s) of The Big Meal are as static as a mortuary waiting room and, often before we’re ready, we must check out. 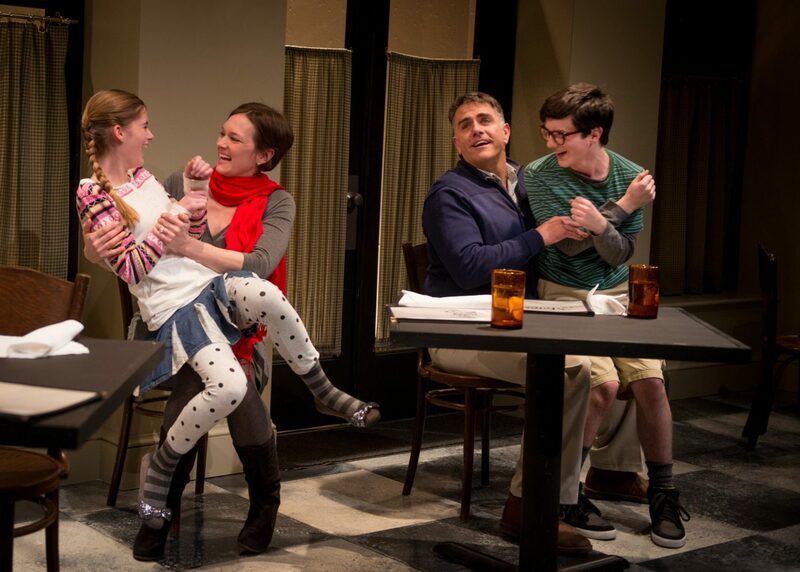 THE BIG MEAL by Dan LeFranc, directed by Tyler Dobrowsky runs at The Sandra-Feinstein Gamm Theatre in Pawtucket through February 9th. Call 401-723-4266 or visit gammtheatre.org/ for tickets.